I know that the headline sounds outrageous, but it is actually true. According to a brand new report that was just released, Americans had to borrow 88 billion dollars to cover their medical bills last year. That is a truly astounding number, and it shows just how dramatically our current health care system has failed. And even though the vast majority of Americans are covered by “health insurance”, millions of us are deathly afraid to go to the hospital because of what it might cost. Today, two-thirds of all personal bankruptcies in the United States are caused by medical bills, and most of the people going bankrupt actually had health insurance. Overall, more than half a million American families are financially ruined by medical bills each year, and meanwhile our “representatives” in Washington are doing absolutely nothing to fix the problem. Surveys have shown that up to two-thirds of the country is living paycheck to paycheck at least part of the time, and an unexpected medical bill can be absolutely devastating for those that are just barely scraping by. Health care costs in the United States are generally measured as the highest in the world. Last year, many Americans could not afford their health care costs and so borrowed $88 billion to pay for that portion they could not afford. 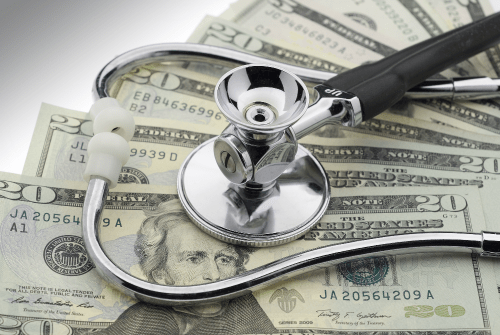 According to a new West Health and Gallup poll, in a new report titled “The U.S. Healthcare Cost Crisis,” the $88 billion was borrowed in the year before the survey, which was done from January 14 to February 20. The poll was conducted via a random group of 3,537 adults over 18 living in the 50 states and the District of Columbia. How in the world is this possible? After all, more than 90 percent of all Americans have some form of health coverage. So why did Americans need to borrow 88 billion dollars to cover their unpaid medical bills last year alone? The law sets a ceiling on how much consumers have to spend on health care. In 2019, it’s $7,900 for a single person and double that for a family. Some bronze plans peg their deductibles to those levels. The average deductible for a 2019 bronze policy — which have higher deductibles, but lower premiums than other tiers of Obamacare plans — is nearly $5,900, while the average maximum of out-of-pocket limit is just under $7,000, according to Health Pocket, an online health insurance shopping tool. Family bronze plans have an average deductible of just under $12,200 and an average out-of-pocket maximum of nearly $14,000. Secondly, even if you have surpassed your deductible, there is still no guarantee that your health insurance company will cover your medical bills. If you do not jump through every single little hoop they want you to jump through, in many instances they will leave you high and dry. When I was running for Congress I had personal conversations with so many people that had been screwed over by the health insurance companies. The more claims they deny, the more money they make, and they have become masters at finding even the smallest loophole that will enable them to wiggle off the hook. Of course there are some health insurance companies out there that are doing a good job, but the bad apples give the entire industry a very bad name. We have a system that is deeply broken, and it greatly frustrates me that both political parties seem so uninterested in getting a solution through Congress. –3.7 trillion dollars was spent on health care in the United States in 2018. That breaks down to $10,739 per person. -If our health care system was a country, it would have the fifth largest GDP on the entire planet. –76 percent of Americans believe that they pay too much for the quality of health care that they receive. -Out of the 36 counties in the OECD, the U.S. ranks 31st in infant mortality. -Prescription drugs are the fourth leading cause of death in the United States today. -Pharmaceutical companies spend approximately 30 billion dollars a year to market their drugs to all of us. –Nearly half of all U.S. doctors are considering leaving the field of medicine, and health insurance companies are the primary reason. -The median charge for visiting an emergency room in the United States is well over a thousand dollars. When I was growing up, my mother took me and my siblings to the doctor constantly. But I don’t know anyone that does that today, because it would be ridiculously expensive in most cases. Another major personal financial concern among Americans is that 45% worry that a “major health care event” would leave them bankrupt, the West Health-Gallup survey found. Additionally, in the past year, 41% said they did not visit an emergency room due to cost. Fifteen million Americans “deferred” purchasing prescription drugs in the past year because of costs as well. Finally, 76% believe the problem will become worse because health care costs will rise more over the next two years. Fixing our horribly broken health care system needs to be a top national priority, but earlier today Senate Majority Leader Mitch McConnell made it abundantly clear that nothing will be done about Obamacare in the Senate until the 2020 election. And of course the Democrats are not going to make any major moves on health care until the 2020 election either. Unfortunately, we are stuck with what we have got for the moment. Our health care crisis is a national nightmare that never seems to end, and it gets worse with each passing year. So for now, just hope that nobody in your family becomes seriously ill, because if that happens there is a good chance you might go bankrupt.